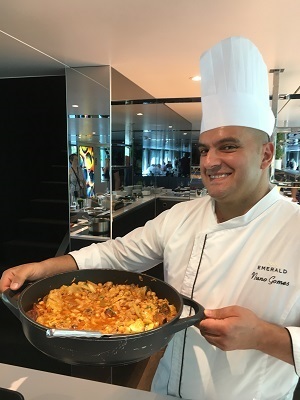 No one goes hungry on a cruise, but on our journey down the Douro River on Emerald Waterways’ Emerald Radiance Bill and I not only ate well we got an education in Portuguese food and wine. 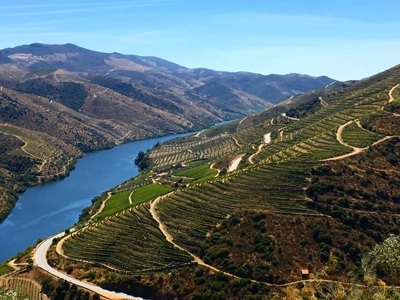 All Emerald Waterways river cruises include wine and beer at lunch and dinner in the fare, and except for last night’s dinner after our excursion into Spain, the wine comes from the Douro River Region, part of which is a UNESCO World Heritage site. We could have ordered wines from other regions on our dime but with so many interesting good options locally, why bother? The Romans planted vines when they occupied the Iberian Peninsula, but Portugal’s most famous wine came along later thanks to the British. When battling France in the 17th and 18th centuries, French wine was a no-no so English ships sailed past Bordeaux rounding the bend of the peninsula to procure their wine from Portugal. To stabilize it for the rocky voyage back to England, they added a bit of brandy and, as the French say, voila! port was born. In 1756 Portugal’s port wine region became the first vineyard area in the world to be legally demarcated. Today this sweet, fortified wine, with an alcohol content of 19 percent to 22 percent, is made from a blend of grape varieties to which grape spirit has been added. There are several types of port, including ruby, tawny, white and rose, that are usually served as a nightcap or with dessert. But the bartender in the Horizons Lounge showed us that port can be used in a cocktail, too. In an afternoon demonstration, he made a white port cocktail with tonic water and we joined other passengers in enjoying samples. Other concoctions on the bar menu include a white port cocktail with passion fruit juice and a rose port with mint. 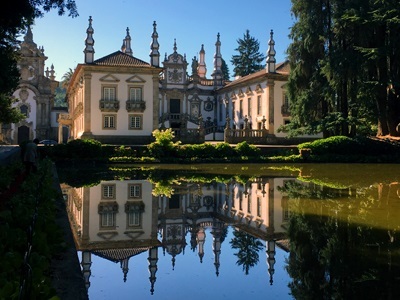 Portugal’s other famous wine, Mateus, also comes from a region in the Douro River Valley, so we learned on an excursion to Mateus Palace. The Count of Mangualde still resides at this 18th-century baroque manor house at least 60 days of the year. The gardens, which the countess insisted be added after her visit to Versailles, are not to be missed and tours of the building include the chapel, entrance hall and religion museum with what the guide claims is the world’s largest collection of religious relics, fragments of the bones of about 20 saints. While the estate does have vineyards, it does not make the famous Mateus rose. Another producer puts out the product but uses the exterior of the manor house on its iconic flask-shaped label. The count receives a royalty. I’ve been hoping to go ashore for a wine tasting at one or more of the many quinta, wine estates, we see sitting amid vineyards on the steep slopes of the riverbank. Some still use the old dome-shaped concrete storage tanks nicknamed “Gina Lollobrigida” for their resemblance to the Italian actress’s famous anatomical asset. Our cruise director, Luis, tells me these wineries can’t accommodate large groups such as ours. He assures me, though, that on our last day we will visit a port wine cellar in Porto. We did visit Quinta da Pacheca for a lovely dinner in its wine warehouse tonight. Seated at tables surrounded by barrels of wine, we feasted on beef tenderloin and drank wine and port while strolling musicians entertained us. Growing among the vineyards in the valley are olive and almond trees contributing a few flavors to a variety of Portuguese dishes. In addition to wonderful entrees, including veal tenderloin, lamb chops and some scrumptious seafood, every lunch and dinner featured a Portuguese dish. 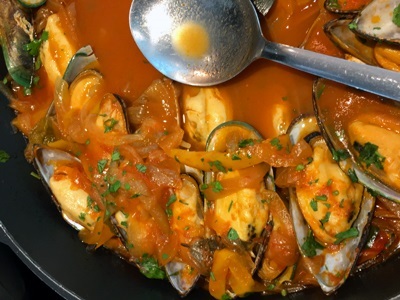 Rancho a Portuguesa, a pork and beef stew one day, Cataplana de Meilhao, mussel stew, another. 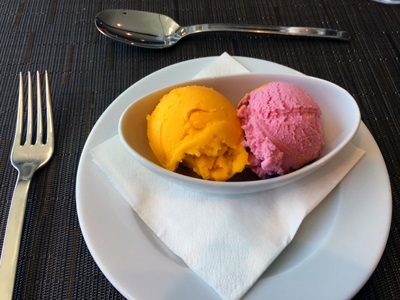 At least two varieties of ice cream a day are made on board as is Pasteis de Nata, a Portuguese custard pastry that appeared on the dessert table and at daily four o’clock tea. This afternoon Chef Nuno Gomes and his pastry chef Carla gave a cooking demonstration with passengers participating in the making of these delicious tarts. I have the recipe, but I’m sure my kitchen can’t turn out any as good as that from the Emerald Radiance galley. After the demo passengers had a tour of the galley. I’m astounded the chef and his kitchen crew can turn out such fine cuisine in such a tiny space and by the energy it must take to carry heavy trays up one deck to the Reflections dining room for full breakfast, lunch and dinner daily, and another to the Horizons Lounge for light breakfast, lunch and dinner daily. One night those trays and lots of other kitchen equipment had to go even higher to the sundeck for a barbecue. 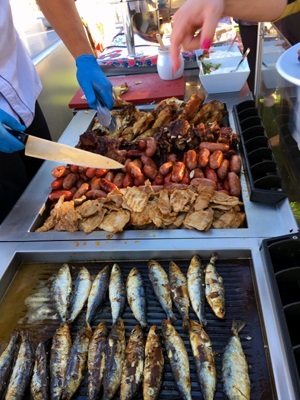 We feasted on grilled sardines, chicken, sausages, pork loin and ribs, along with a variety of breads and salads while servers poured glasses of red sangria. I was thinking of that meal on our excursion to the Coa Museum at the world’s largest open air Paleolithic rock art site. Some 1,200 stones have been found with petroglyphs dating from 10,000 to 40,000 years ago at this UNESCO World Heritage Site. Most depict animals at the time: horses, goats, deer, boar. We attended a workshop where a museum expert demonstrated how these prehistoric people made spears to hunt for food and use bits of flint to make a fire to roast it. I’m glad I live today when Chef Nuno can work his magic with modern tools in the galley.